Previews of The Rite would lead you to believe the film is a terrifying thriller about battling demons (and the Devil himself) via the rite of exorcism. This is at least half true. The film pits a young, conflicted, would-be priest, Michael Kovak (Colin O’ Donoghue) against a motley crew of demons that have seemingly taken up residence in a number of citizens in Rome. But, as far as terrifying goes, let’s just say the Devil is not at his best in this one. The Rite begins with Michael Kovak in the midst of preparing a body for a funeral. Kovak works at a funeral home with his father, Istvan Kovak, played grimly by Rutger Hauer. Appropriately, Kovak seems a bit glum and dark working with corpses all day. Unsure about what to do with his life, Kovak joins seminary school and heads down the path towards priesthood, which is apparently somewhat of a family tradition along with working at funeral homes. Kovak’s uncertainty doesn’t disappear upon attending seminary school. In fact, seminary school appears to leave him even more uncertain and lacking in faith, albeit for reasons that are never clearly explained. Before opting to bail out, he is implored by one of his instructors to try a special exorcism program in Rome. Apparently, there have been a glut of exorcism reports and the Vatican needs to train some new exorcists. So, The Rite gets off to solid start with a conflicted protagonist embarking on a journey that certainly will test his faith and exactly what he believes in. It’s ominous and spooky, but not terrifying. Interestingly, the beginning of The Rite mirrors the start of 1408, the film director Mikael Hafstrom is perhaps best known for. The problem with The Rite (which was somewhat of a problem for 1408) is that it never really graduates beyond spooky and ominous. Hafstrom does a great job establishing a consistently dark tone of foreboding, but the few moments in the film that are intended to be scary don’t exactly make your skin crawl. In addition to the “scary” moments not being particularly scary, the tension in the film isn’t raised consistently or effectively. One of the other challenges The Rite faces is a lead who just isn’t very compelling. While Colin O’ Donaghue does a decent job of portraying a confused, conflicted priest, Michael Kovak comes across as dull and boring. His lack of faith remains a mystery for most of the film and the purported reason that is proposed for his crisis of faith doesn’t really ring true. Fortunately, we have Anthony Hopkins playing a quirky, unconventional Father Lucas who has more than a few exorcisms under his belt. He serves as a mentor of sorts to the conflicted Kovak. Hopkins does a great job of playing a man who clearly walks the fine line between genius and madness. It’s never really clear if Lucas is a charlatan or the real deal. The most disturbing and terrifying moments of the film involve Hopkins, who isn’t onscreen nearly as much as the comparatively boring O’Donaghue. 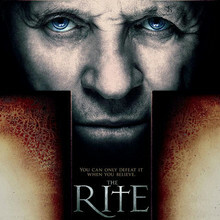 Unfortunately, a solid start, a decent ending, and a good performance from Anthony Hopkins don’t make up for the absence of real tension and scares throughout most of the film, which is what The Rite is purporting to sell. It’s not painful to sit through the film; it’s just not scary or compelling enough to rise above mediocre.